You can customize the layout of your place's Overview page to organize it better and display your group's information. The Overview page must be added to your place. For more information, see Adding Overview page. When you customize the Overview page for a place, you decide on a column view, then drag widgets into the layout. Go to the Overview page of your place, and then gear icon > Edit overview page. 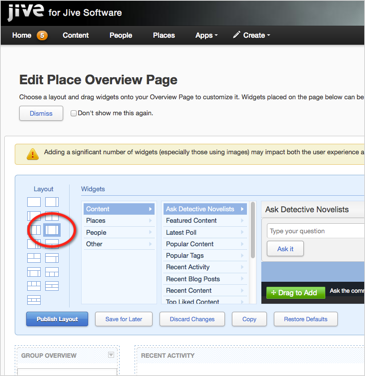 Under Layout, select the layout for the page. Note that the available widgets depend on the layout you selected. Under Widgets, select a widget you want to add and drag it into one of the layout columns below. To configure the widget, click > Edit this widget in the upper right corner of the widget, and specify its properties in the dialog box. Click Save Properties to save the widget settings. For every widget you want to add, repeat Steps 3-5. To remove a widget, click > Remove this widget in the upper right corner of the widget. To save all your changes, click Publish Layout. The changes are saved and, the updated page becomes visible to other users.